Description of "The Healer Within"
'The Healer Within' is a self journey of the author on the meditative path of an awakened, thoughtful and blissful life. While travelling on an inward journey, she meets patients whom she calls her 'healies'. How each one's battle with themselves for recovering from physical/emotional and psychological illness is her guiding force for showering a happy healthy life to them. 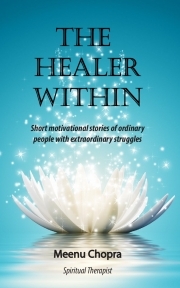 'The Healer Within' is a story of each one of us who may have themselves or seen their loved ones suffered from a prolonged illness and resorted to all sorts of treatments. The book is about motivating stories of ordinary people with chaotic lives, determined to fight back their dis-ease and bounce back to a new, wakeful life. Based on ordinary people and real events, the author has tried to reiterate that each one of us have healing powers within us to encounter and fearlessly combat with life problems. It is only the determination and will to live that transcends into a purposeful and worthy life. Meenu is an entrepreneur and a Spiritual Therapist. While counseling people is her passion, she partially assists her husband in his venture of running an international BPO. Before that, she ran her consulting firm for 7 years. It was however her karmic intervention that changed the course of life and made her a full time therapist. She conducts meditation therapies for children and women. While writing has been her innate desire since childhood, through this book she has tried to meet people struggling to lead a peaceful life and helped them meet with themselves. Meenu lives in Chandigarh with her husband Nitin and daughter Aanandini. Reviews of "The Healer Within"